Hospital Medical Health Care Websites. Peter M. Ranta, M.D. is a Board Certified Pediatric and Adult Allergy and Asthma Specialist located in Sault Ste. Marie, in the beautiful Upper Peninsula of Michigan. 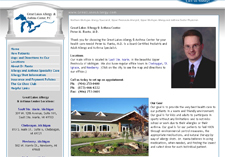 Great Lakes Allergy also has regular office hours in Cheboygan, St. Ignace, and Newberry. The Sault Tribe Health Division has 7 health clinics or centers providing various levels of medical services throughout our seven county service area located in the Upper Peninsula of Michigan. Visitors can easily browse and learn of the many great services that we provide to our members. Here you can learn about our Health Center locations, services that each location offers, find a provider, view health events, along with a wide range of other important information.